With yesterday serving as the 10-year anniversary of the 2008 Town Hall Presidential Debate, Belmont University confirmed today its intent to pursue hosting another debate in 2020. The University will officially submit its proposal to the Commission on Presidential Debates in the first quarter of 2019. Belmont previously hosted the 2008 Town Hall Presidential Debate between then candidates Sen. John McCain and Sen. Barack Obama, and the University served as the official alternate host site in 2016. In addition, the University will be hosting the final of three Tennessee gubernatorial debates this Friday. 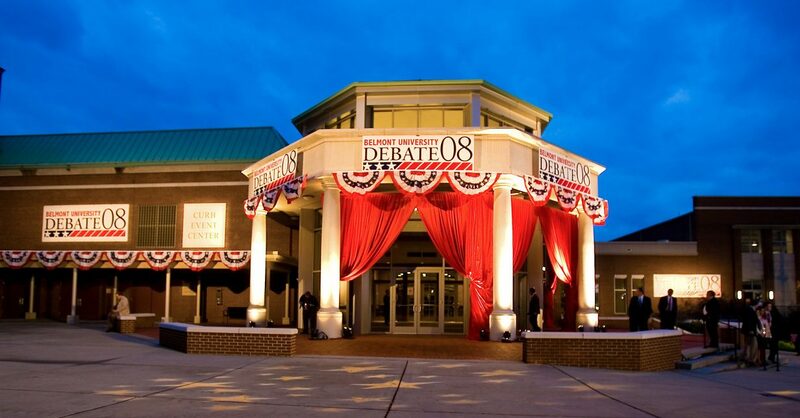 The Mayor’s Office and the Nashville Convention & Visitors Corporation (CVC), both strong partners for the 2008 debate and subsequent bids, will once again step forward to support Belmont’s efforts to bring a presidential debate to middle Tennessee. Following the 2008 Town Hall Presidential Debate, a writer for USA Today noted, “Belmont University in Nashville proved that small places with big ambitions could be world-class stages.” Now a decade later, the explosive growth of both Belmont and Nashville has made the “small places” phrase obsolete, and each has repeatedly proven its ability to provide “world-class stages” for an array of large events. Since 2008, Belmont University has continued to demonstrate its expertise hosting major broadcast events, including numerous gubernatorial and mayoral debates, the internationally televised Davis Cup tennis competition and, most recently, the television taping of “CMA Country Christmas” featuring artists Reba McEntire, Brad Paisley, Michael W. Smith, Tony Bennett and Diana Krall, among others. The holiday special will air on ABC later this year. Moreover, Nashville has drawn an increasing number of significant opportunities that bring thousands to a city whose reputation continues to expand beyond its Music City moniker. By the time of the 2020 debate, Nashville will have hosted annual CMA Fest events drawing capacity crowds, the 2016 NHL All Star weekend, annual July 4th “Let Freedom Ring” celebrations exceeding 250,000 attendees and the 2019 NFL Draft, not to mention a variety of conventions, festivals and award shows. The city will also be in the national spotlight in 2019 with next fall’s release of Ken Burns’s newest documentary, “Country Music,” a series sponsored in part by Belmont. With more than 41,000 hotel rooms in the metro area, a robust tourism industry and an inclusive hospitality mindset, the city is well prepared to host the political dignitaries, guests and media that would accompany a presidential debate. In fact, more than 5,000 new hotel rooms have opened in Nashville in the past five years alone with another 5,400 under construction in Davidson Country, a strong indication of the area’s ongoing popularity as a must-see destination. Many of these spaces come in a dozen new full-service and boutique hotel brands located in the heart of downtown. The 2008 Town Hall Presidential Debate, the first to be held in Tennessee, scored a ratings coup nationwide. According to Nielsen Media Ratings, more than 63.2 million homes nationwide tuned in to view the 2008 Town Hall Presidential Debate, the largest television audience of the three presidential debates held that fall. In addition, the event attracted thousands of media and other visitors to Nashville and resulted in both an economic boost and more than 5,200 media hits in the days leading up to and following the debate.